Called Total Pest Control Solutions to remove an unwanted wasps nest from our garden shed after the local authority said 2 weeks waiting list, TPCS attended same day we called…AMAZING SERVICE, Thank you Gerry. Have used Total Pest Control Solutions before, and had to call them out again this year to deal with 2 wasp nests, yet again, no wasps to be seen within 24 hours of treatment. Treated a hornets nest in the eaves of our house swiftly and safely…Very reasonable price too..Two other local companies that quoted us, were twice their price, and were not available the same day. Used Total Pest Control Solutions for a bad flea infestation we encountered on our return from holiday, found their technician Gerry very friendly and knowledgeable, problem was cured within 1 visit to our house. Very Happy. Outstanding same-day service from Gerry. Dealt with a wasp nest in our garage very quickly and efficiently. Would highly recommend him. If you are unfortunate enough to get bed-bugs, there is only one company i advise you to call….Total Pest Control Solutions….simple. Rats in the kitchen, until Total Pest Control Solutions fixed them. Got a cockroach problem courtesy of building works next door, was given Gerry’s number via the British Pest Control Association, who attended & treated our kitchen within 3 hours of our call. One visit and 2 weeks later, not a cockroach to be seen. Unfortunate problems with rats in our cavity walls and loft, TPCS came and made a thorough survey of the problem, and identified a major defect in the drain system that was allowing access to the rats, took a few weeks to totally eradicate the problem, but all good now. Had a few wasps coming into our bathroom, called Gerry out, who identified, and dealt with a large wasps nest in our loft area… have used Total Pest Control Solutions in the past, and will do again if needed. Noticed wasps appearing on our bathroom window, but couldn’t work out where they were getting in, phoned total pest control solutions, who sent around a pest control technician, that afternoon. He managed to find and remove the nest within 20 minutes, cleared up the dead wasps and left us a written guarantee that we would not have any more problems, been 2 weeks now and we have not seen another wasp. Thank you very much Gerry. Removed a wasps nest from our loft, within 3 hours of us calling…..First class service. Had what we thought was a wasp problem in the eaves of our house, called Total Pest Control Solutions, who arrived the same day, and soon informed us that they were not wasps, but bees, and that they did not treat bees, they gave us the number of a local bee keeper who came out and managed to remove the bees for no charge.Thank you Gerry, quality company and service. Called out Total Pest Control Solutions to deal with rats that had got into our loft. In Three visits, they had identified that we had a major drainage problem, that was giving the rats access to our cavity walls, fixed the problem, and totally got rid of all the nasty rats. Hopefully will never have to use them again…… But would advise you do, if you have a similar problem. We noticed patches of our carpets were being mysteriously destroyed, so called in Total Pest Control Solutions who very quickly identified that we had a problem with Moths. After a very thorough inspection of the whole house, they gave us information on exactly what we needed to do. They came back 2 days later and fumigated all the affected rooms. No signs of moths since. Highly recommend this company. Managed to sort out our Cockroach problem in One visit! Thank you Gerry. I cannot recommed this company highly enough!!! We had a nasty problem with ants and didn’t know what to do. Gerry was so kind and friendly – took his time to reassure us and gave full instructions on the treatment. He completely put our minds at rest. He said he would be straight back if the problem had not been resolved, but to my amazement,. not ONE ant has been seen since! I’m so pleased – his service is exceptional. He will be the first person I’ll call for any future pest problems!! Contacted Gerry he was here within 4 hours, which was the time he quoted very professional will come back in 7 days if the wasps are not gone and do the work again free of charge All work guaranteed for a Year Reasonable charge VERY IMPRESSED RECOMMENDED TO ANYONE WITH WASP PROBLEMS. Squirrels in my attic were driving me crazy, destroying insulation, threatening the support beams and making a racket! I phoned a couple of “BIG NAME” companies, all were ridiculously over priced and one failed to get back to me after three calls. I found Total Pest Control Solutions. Gerry was very pleasant, he came round at short notice and at times that suited me. For a very reasonable price he dealt with the problem quickly and humanely. Professional and reliable, I thoroughly recommend the service. If you have the misfortune to be infested with pests this company is a good choice. The service was excellent from start to finish. Gerry explained clearly what was needed from us to ensure that the problem was contained and to enable him to do his treatment. He was reliable always keeping us informed about his arival time. The job was done swiftly with no messing about. Finally I’d like to say that all was done in a friendly and pleasent manner. Good job. Had a problem with bedbugs, after we had visitors staying…called total pest control solutions, and they were with us within 24 hours for a survey…told us what we needed to do, and came back the following day and treated our bedrooms. had a follow up treatment a few weeks later, and have’nt been bitten since…sleeping peacefully again…Totally professional and highly recommended. Ant problem. Prompt service.effective treatment on 1st visit, no futher call back required.liked the courtesy follow up call. Excellent Service, wasps eradicated – Answered phone on Sunday, came to do the job on Sunday (much appreciated! ), very friendly, did the job quickly, gave a professional guarantee that the wasps would be gone in 2 days (and was correct) and to ring him back if they were not. Will be using the service again if a need arises. I called Total Pest Control Solutions out to deal with a wasps nest by the chimney, after the council had told us, they would not be able to treat a nest so high???. (Was not impressed) Within 3 hours of calling tpcs, they had came around and sorted the problem. (Impressed) and to top it off, they were also considerably cheaper than the council. I know who we will be calling if we are unfortunate enough to get any other pest problem. The company is very professional in its approach. Timely visits and treatments ensured the pest control problem was dealt with in a timely and efficient manner. Gerry was very good as left paperwork detailed with work carried out and costings. Will use again should the need arises and will recommend the company on to others for sure. I found Total Pest Control Solutions to be professional and reliable, and would highly recommend them to anyone. 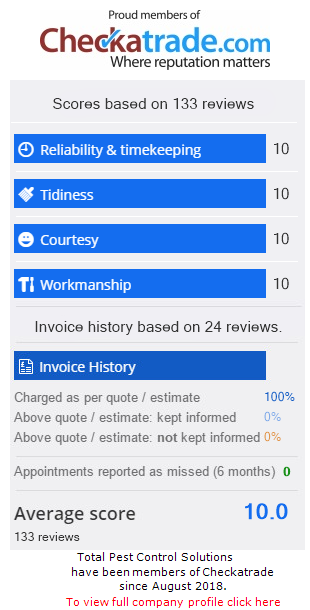 Thank you very much for the great service that you provided, and excellent response time. We have not seen any activity at all since your last visit, so are sleeping easy again. The pest controller was excellent and we were very impressed with his courteous manner and indepth knowledge on our unfortunate infestation. Since having Gerry in our warehouse on a regular basis, we have had no more problems with rodents or the damage that they caused. Gerry came, destroyed and then removed a massive wasps nest that we found in our loft. We had called the Council but were told we would have to wait 2 weeks. TPCS came out the very day we called them. A 5 star service… Thank you. I have been using total pest control solutions for over 2 years now. I have a number of rented properties, which have suffered from various pest problems, such as mice, bedbugs and fleas. TPCS have always dealt swiftly and discreetly with my problems, and that is why i continue to use them. They have not let me down once. Highly recommended. I have used Gerry a number of times for my Estate Agency and found him the most effective of all the local pest control people in the area. Not only is he very friendly he is also very professional in his work and takes on the problem and does not stop until the job in hand is dealt with. I have used others but only Gerry wants to find the root of the problem so it doesn't occur again. Others seem to find a short term fix so they are called back so it is needless to say that I will continue to use Gerry in the future. Keep up the good work. Gerry provided a brilliant service and was able to give valuable advice and support throughout the process to resolve the issue successfully. Would highly recommend. Called Gerry to sort an ant problem. He came within a couple of hours and got straight to work. What a lovely guy - very personable and professional. Gave lots of tips and made me feel so much better. Explained the whole procedure and what to expect. Very good price as well. Highly recommended. Well done! Rat Problem in Harrow I live in a ground floor flat in Harrow, and have been having ongoing problems with rats having access to the kitchen through badly finished flooring under kitchen units. Gerry of Total Pest Control Solutions has been marvellous in helping me deal with the problem, always prompt to arrive for appointments and always ready to explain exactly what the various treatments would involve. Gerry was not content to sign off the job until things had been thoroughly investigated and the root of the problems discovered. Exceptional, concientious, friendly and professional service I would happily recommend to anyone.